The Adam A500 is a six-seat civil utility aircraft currently in production by Adam Aircraft Industries. The aircraft is of pod-and-boom, push-pull configuration with its two TCM TSIO-550 piston engines mounted to provide centerline thrust. Compared to conventional twin-engine installations, the centerline thrust arrangement reduces drag and maximizes the controllability of the aircraft should one engine malfunction or fail. The A500 airframe is largely built of graphite composite materials. Other features include FADEC and cabin pressurization. The prototype A500 first flew on July 11 2002 and was FAA certified in early 2005. 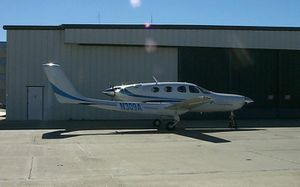 The A500 was developed from the M-309 CarbonAero technology demonstrator designed by Burt Rutan and built by Scaled Composites at the Mojave Airport. The "309" designation refers to this being Rutan's 309th aircraft design. 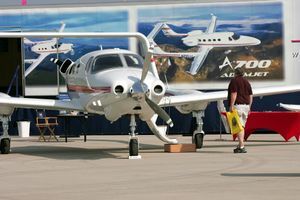 The 309 first flew in March 2000, but the aircraft has since been gutted and is used as a static display outside the Adam Aircraft Industries headquarters. The A500 was featured in the 2006 film Miami Vice. ↑ A500 Performance and Specifications. Adam Aircraft. Retrieved on 2006-09-23. This page was last edited on 5 March 2007, at 09:35.